The Monogram Rocking Chair is signed and dated under the seat. The chair is finished with multiple coats of an oil/varnish blend, which provides both protection against staining as well as bringing out the wonderful depth of colour and lustre. Over the last three decades David has been commissioned to design and build a wide range of furniture for clients all over the globe. He is best known for his design, the Monogram rocking chair. Educated in the United Kingdom, David moved to New Zealand in 1976. Changing direction after completing a history degree at Oxford University, he began developing his craft as a woodworker. Starting with antique restoration and then simple pieces like chests and tables, David gradually developed his own design aesthetic and became interested in chair design in particular. The Monogram rocking chair was based on a pencil sketch drawn over breakfast one day that gave him the central concept of a few sweeping curves that he’d been trying to bring together as a chair design. 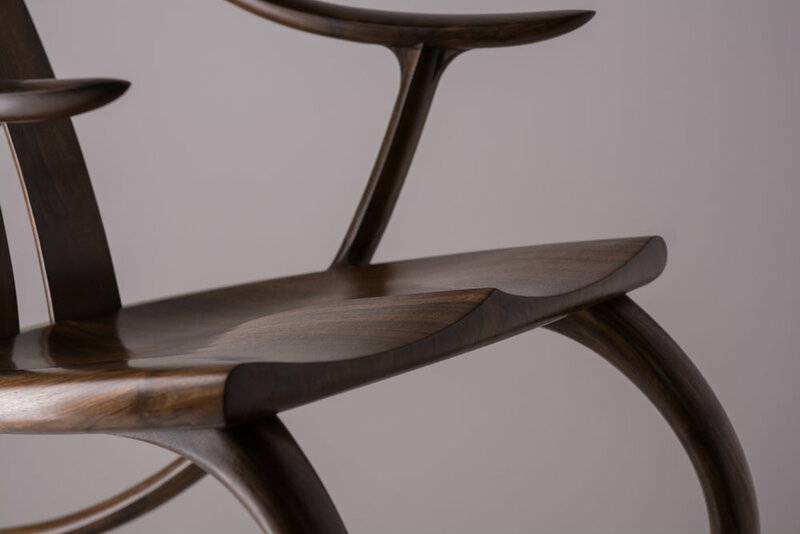 The first chair then took three months to build, and though David has modified and improved many of the details and construction processes, the purity of the interconnected curves of the original design have remained. Ergonomics were carefully considered from the start and the chair is both comfortable and well balanced, with a slight springiness and full lower back support. The Monogram rocking chair is now a design classic. Its interconnected curves create a supple, strong and elegant support for the human body. Built in Cable Bay, New Zealand, Monogram rocking chairs are treasured in homes around the world. They have been exhibited widely, and an example is held in the design collection of the Museum of New Zealand, Te Papa Tongarewa. This chair is made from an English Walnut tree grown on the west bank of the Motueka River in the Tasman region. The chair measures 1100mm x 900mm x 600mm and can be shipped worldwide - please contact us to quote for freight.